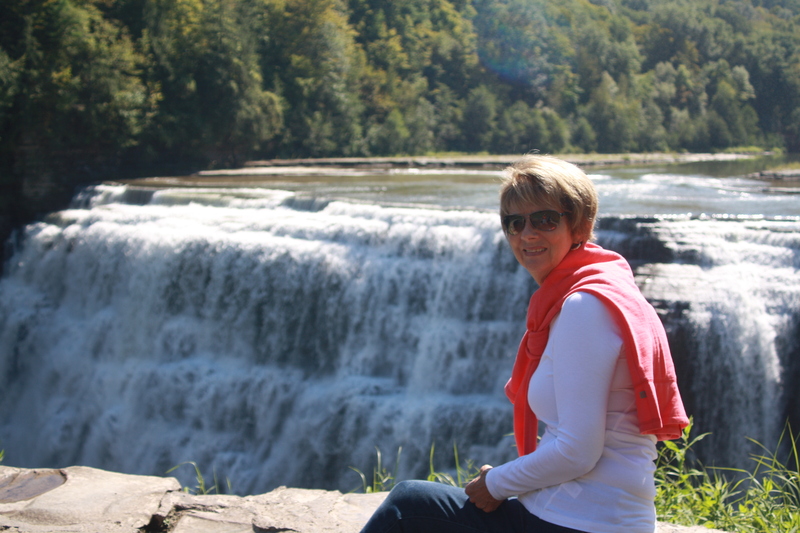 A Day at Letchworth State Park – Let's Go RVing! 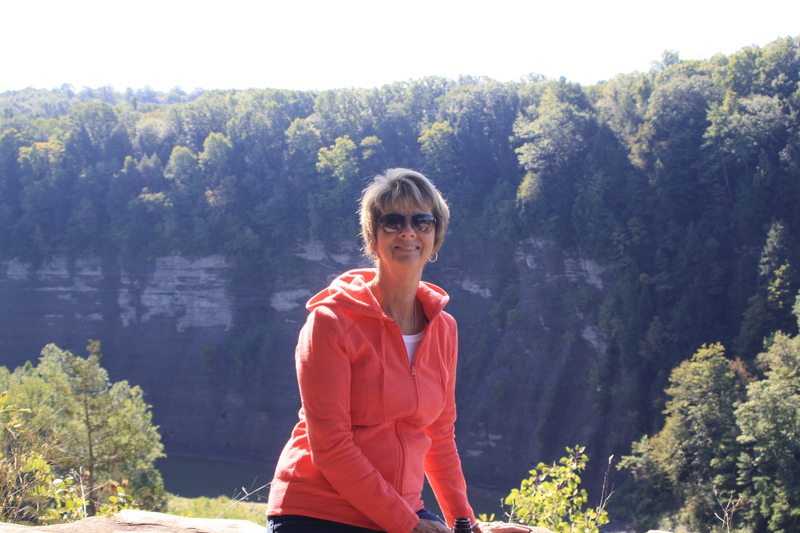 We headed out just before 10:00 to spend the day at Letchworth State Park which is fairly close to our campground. $8.00 for a day of entertainment is pretty good! We started at the North End and our first stop was at a lookout at HogsBack. It is called the Hogsback for its resemblance to a wild boar’s high hunched spine. 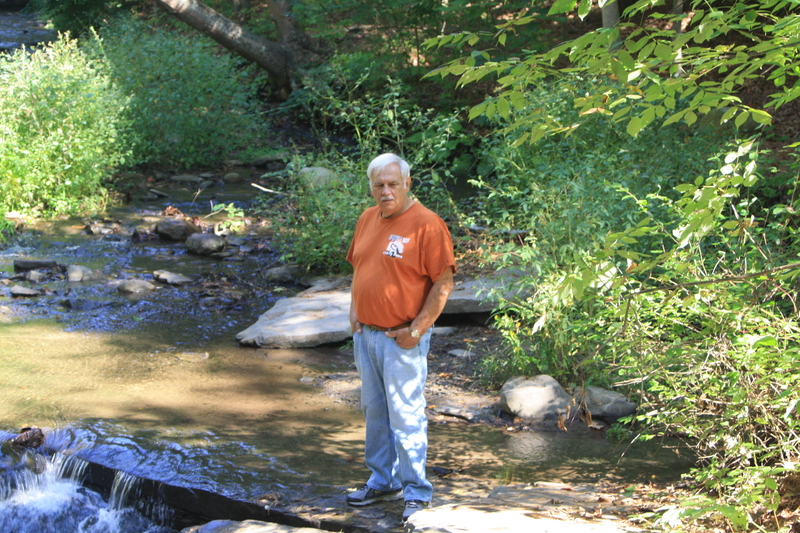 It’s a ridge jutting into the canyon and the Genesee River flows one mile around the narrow peninsula. The scenery is spectacular and absolutely impossible to capture with my camera and my photography skills – or lack of. Along the way we talked with a couple accompanied by their daughter and we continued to see them at each stop. They were a bit ahead of us and as we were turning in at one site they waved at us to keep going as it there wasn’t much to see there! The park is definitely the eastern Grand Canyon. 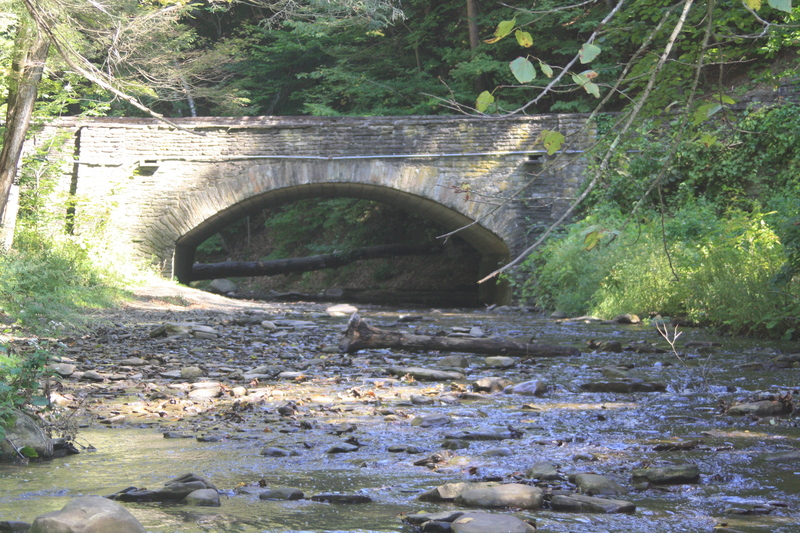 We stopped at several overlooks, one that had a stream with a beautiful stone bridge in the background. Jerry walked out onto the rocks and got one for his collection. We hiked up some steps and Jerry took my picture so I could send it to Trent entitled “Hiking with my Brooks”. This must be a good time to visit as the number of people never got crowded or overbearing. We continued on and after several stops we reached the Lower Falls. Simply put, they are amazing. Because of the makeup of the rock these falls continually change. A stop at the Visitor’s Center was on the itinerary as we needed to add a magnet to our fridge collection. Upon first glance I couldn’t find one that I thought would withstand the bumping down the highway but Jerry found one. He also took a picture of me in front of the sign declaring the park as the best park in America for 2015. Our next stop was a brief tour of the museum honoring Mr. Letchworth. Never married, he was quite the philanthropist and started hospitals for the mentally incompetent and for epileptics among many other things. We walked over to the Glen Iris considering the possibility of lunch. The menu didn’t look too appetizing so we decided to go back down to the café at the Lower Falls for lunch since we didn’t pack our usual picnic today. Lunch was surprisingly good, cheeseburgers! Next we visited the restored Seneca Council House and the grave of Mary Jemison, the White Woman of the Genesee. Her family was attacked by Indians and all were killed except her and she went to live the Indians eventually marrying the chief. 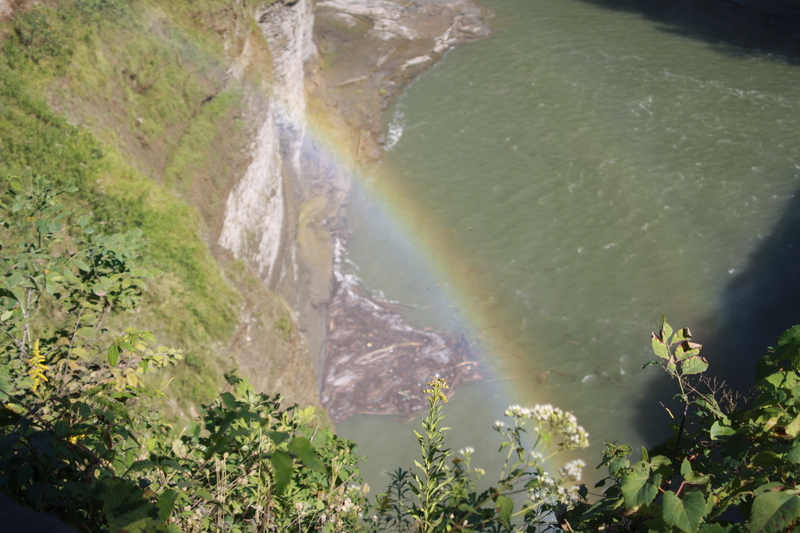 Along the way we stopped at Inspiration Point that overlooks Letchworth Gorge and the Genesee River. Again, absolutely stunning views. We eventually wound around to the Middle Falls which are the highest and the most spectacular. We then walked on to the Upper Falls which has an active railroad trestle crossing immediately above it. By this time it was getting warmer and we still had to hike/walk back to the Middle Falls at Glen Iris. It was not a difficult hike although there are any number of uneven steps that could be a bit treacherous. Even so, I was glad to see the Glen Iris and the parking lot! Afterward we left the park and instead of turning right like we should have we turned left. Because we were so close to our campground we didn’t even think about using the GPS. Wrong decision. We got to see several of New York’s little villages and hamlets and because we also have a rather stubborn and mixed up GPS we toured Houghton College! We eventually made it back to Mt. Morris where we were hoping for a grocery store. We finally located a Sav-A-Lot. We only spent a little over $8 so we must have saved a lot but that could be because they didn’t have everything we needed plus they don’t bag the groceries! That could be our last trip to a Sav-A-Lot. Back to the campground for some rest and relaxation before dinner, salmon on the grill. We are two pretty tired people tonight so it’ll be an early night. Let’s hope I can get a good night’s rest. Worrying about Mom has cast a pall over this trip thus I am unable to sleep at night. An earlier phone call to Cypress Glen did nothing to disspell my anxiety.